Having a wedding ceremony in Tenerife couldn´t be easier. I work in all areas of Tenerife performing wedding ceremonies at your choice of location and time preferred. With stunning land scapes and some of the best beaches in the world, and your very own personalized ceremony,your wedding ceremony will truly be a memorable event. 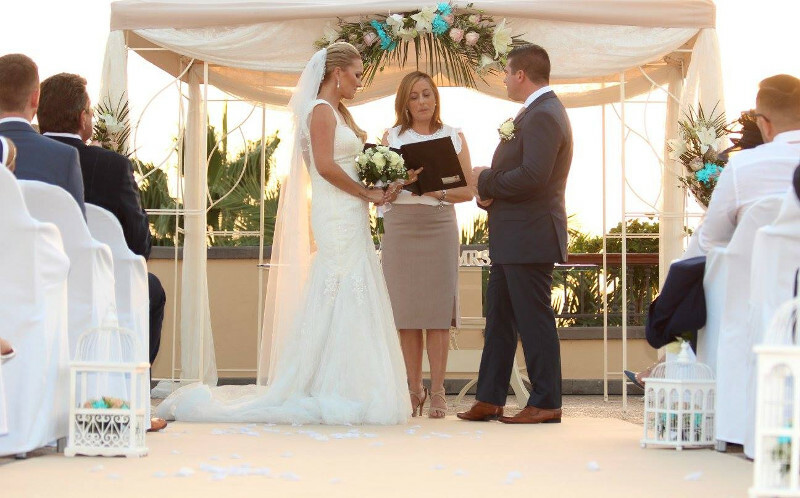 As your Tenerife Wedding Celebrant, I strive to ensure that your ceremony sets the tone for your wedding day, I know you want the moments spent in the ceremony to be meaningful, not an impersonal perfunctory rite. A hallmark of my Wedding Celebrant training is to make your ceremony that special moment that starts the rest of your lives together as a loving couple. An outward symbolic ceremony is becoming increasingly popular with couples, choosing to perfom a sand ceremony, rose ceremony or candle ceremony, these can easily be accommodated for please see the page on symbolism in ceremonies for more information. Please be aware that I am not a legal registrar and therefore the service I provide you does not make you legally married in the eyes of the law, you will need to be married at your local registry office before hand. My fee for a wedding ceremony is 320€ with a deposit of 50€ placed at the time of booking. The remaining 270€ balance must be paid a minimum of 2 weeks prior to the ceremony date.